Three hundred travelers started the summer with a travel nightmare that they will not soon forget. Even before the Virgin Atlantic flight left London’s Heathrow Airport, there were problems. The generators were not working, so the air conditioner was not working, passengers said. The flight was supposed to leave at 5:33 p.m., London time. Two hours later, with the plane fixed, the flight took off for Newark. But problems arose again on Tuesday night because of storms in the New York area. The airline needed to divert the plane. With no option to land at JFK, it landed in Bradley Airport, the company said. When the plane landed on the tarmac, the generators went for the second time, passengers said. With no fresh air coming in, temperatures reached about 100 degrees. A Virgin Airlines flight was supposed to land in Newark on Tuesday night. Instead, it landed at Bradley because there were storms in New Jersey, but passengers weren't allowed off the plane until Wednesday morning. For four hours, they sat on the plane. During the ordeal, pilots exceeded their maximum flight time and the plane had to stay grounded. Janine Doy, a Virgin spokeswoman in London, told The Associated Press that the planes have water fountains aboard, but she wasn't sure if any food was left over after the in-flight meals had been served. Andrew Porwancher, of Princeton, New Jersey, said people were fainting. One passenger was taken to a hospital, but airline officials said there is no evidence to link this with the flight. Others started screaming, "You can't treat us like animals," passengers said. Eventually, the 300 people were brought into a terminal, where they waited at least two more hours for their luggage and instructions on how they would eventually get to Newark. The flight was scheduled to reach Newark at 9:10 p.m. on Tuesday. On Wednesday morning, many passengers are still trying to reach their final destination. 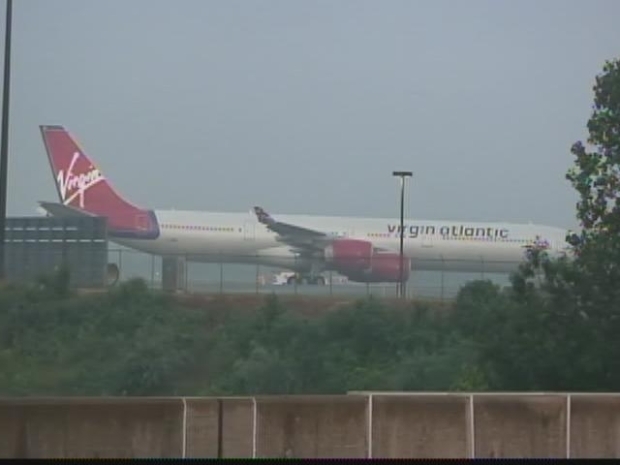 Virgin Atlantic officials said Bradley Airport is not equipped to deal with international arrivals, so Virgin Atlantic had to wait for U.S. Immigration and Customs to arrive to process the passengers. Bradley Airport spokesman, John Wallace, said the airport doesn't have a lot of international flights, and customs officials generally work during the day. He says customs personnel got back to the airport about an hour after being called Tuesday night. "Everyone did the best they could under the circumstances," Wallace said. "The process to do clearance when you have 300 people is going to take a while, plus their luggage." Airport managers tried to find motel rooms for the stranded passengers but because of the PGA golf tournament in Cromwell, there were no available rooms. A Virgin Atlantic spokesperson said the passengers will be bused to Newark. The airline says safety and welfare of passengers and crew "is of paramount importance and apologizes for the frustration and inconvenience this has caused for the passengers. However, they will not compensate them the inconvenience. Regulations require airlines to compensate under some circumstances, but a weather delay is not one of them, according to Virgin Atlantic. "We fully comply with EU regulation 261/2004 which amongst other obligations requires airlines to give compensation under certain circumstances for flight cancellations and delays," Virgin Atlantic officials said. "However an exemption is made if the cause of the cancellation or delay was due to extraordinary circumstances which could not have been avoided even if all reasonable measures had been taken. As flight VS1 was delayed in arrival into Newark because of the weather conditions in the New York area this exemption applies." The three-hour limit on tarmac strandings that went into effect in April doesn't apply to foreign carriers or international flights by U.S. carriers, although U.S. carriers are required to have contingency plans for returning passengers waiting for prolonged periods on planes to airport terminals. Earlier this month, Transportation Secretary Ray LaHood proposed extending the requirement for contingency plans to foreign carriers. The proposal included a request for comment from airlines and the public on whether the Transportation Department should also extend a firm three-hour limit to international flights by U.S. and foreign carriers. "The events reported overnight in Connecticut reinforce my belief that passengers have rights and are entitled to fair treatment when they fly," LaHood said in a statement. "Our aviation enforcement office will be looking into the incident to determine whether any violations occurred." The delays frustrated not only the passengers desperately waiting to get off the Virgin Atlantic plane in Connecticut, but those waiting to get out of Newark on the airline as well. Ken Cast, an airport operations specialist at Bradley, said Virgin is not one of the airport's carriers and the airline had to call in personnel to handle the passengers. "Being an international flight, it's not like you can let people wander aimlessly," Cast told the AP. "They need to be processed, and they need to be kept safe. Everyone has to clear customs. Eva Shah may not even make her own wedding. Shah was supposed to fly Virgin Atlantic to Mumbai, but the Newark flight she needed to take to connect in Heathrow to complete the trip to India has been delayed 23 hours, her future brother-in-law, Justin Holmes said by e-mail. Holmes said the airline will only offer Shah a refund and will not transfer her to a more expensive flight. The airline couldn't immediately be reached for comment on that matter.